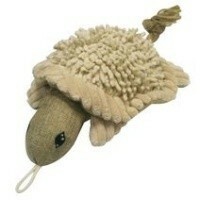 Danish Design Timothy the Natural Turtle Dog Toy is a luxurious and extremely high quality plush toy for your dog. Made from only the finest materials, this toy features a textured turtle shell and a hidden squeaker to keep your dog interacting and entertained for hours. Perfect for all kinds of fun games, this fantastic toy will make the perfect companion for your dog! Toy measures 10" in size.